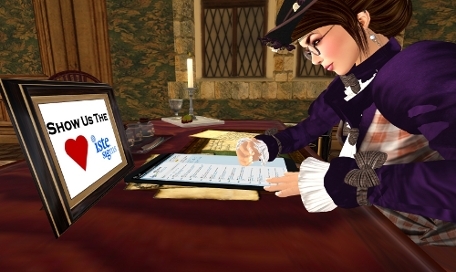 Checking my SIGMS Twitter feed on my Droid Nuit in Second Life. Yes, it really does work like a tablet! Making my list and checking it twice - cause I will be a sad librarian if I forget something. Rule of packing is pull everything you want to take and then cut it in half. However, the rolling techie case will be fully loaded. To make things easier at the airport I'll pack miscellaneous power cords in my suitcase. My sister is coming with me so this should be some trip. Susan is definitely newbie techie. She always calls me late on Sunday night when she if frantically trying to research for articles or needs rescuing to put together a presentation. She is working on, I think, her third certification. She already is certified for Biology & English for 7-12 grades, Administration, and now Guidance Counseling. Figure next week will be an eye-opening experience for her when I drop her into the SIGMS crowd. Now where is that suitcase? Time to pack!